Let the Builders' Hardware team apply inspection, testing, and maintenance provisions for fire door assemblies in accordance with NFPA 80. 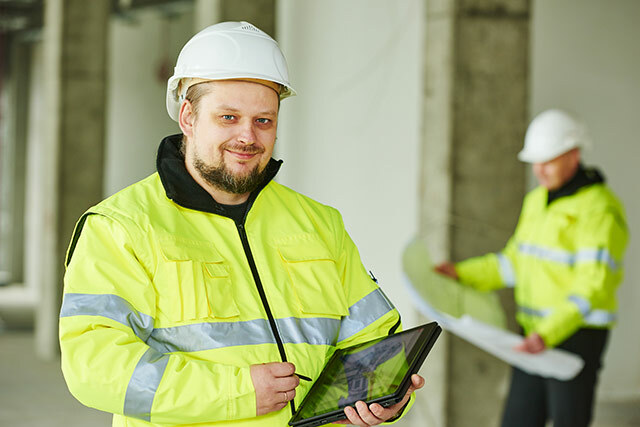 Annual inspections and planned maintenance of your door openings are a proven way to help ensure reliable protection for your facility and its occupants. Based on NFPA 80, Standard for Fire Doors and Other Opening Protectives, documented inspections for fire-rated door assemblies are required on an annual basis. The specific requirements can be found in the following NFPA 80: Standard for Fire Doors and Other Opening Protectives editions; 2007, 2010, 2013, 2016. Every 19 seconds, a fire department responds to a fire somewhere in the nation. A properly functioning fire door assembly can mean the difference between life and death. Builders’ Hardware and Specialty Company is a certified and fully insured for fire door inspection. Our offering is formulated as a service to building owners in order to ensure that your building is up to code and that it meets the requirements of NFPA 80, which now requires annual inspections and reports for fire rated door assemblies. Our expertise in this industry stems from many years of selling and installing fire door assemblies. Call us today to make sure your building is safe and secure. Builders' Hardware is trained and certified to perform and record the annual inspections in accordance with the NFPA 80 requirements. Our Certified Fire Door Assembly Inspectors can perform the routine annual fire door inspections. And if you are a health care facility operators we can help you to ensure your facility is prepared for the The U.S. Centers for Medicare & Medicaid Services (CMS) audits. Contact us today and schedule an appointment with one of our Certified Fire Door Assembly Inspectors. Together, we’ll help make sure your people, facilities, and assets are safer and more secure. Builders' Hardware and Specialty Company understands fire door inspection regulations. Our team of certified professionals can perform your NFPA 101: Life Safety Code® and NFPA 80: Standard for Fire Doors and Other Opening Protectives Fire Door Inspections. We can help ensure fire door compliance throughout your facilities. By conducting yearly inspections of your fire door assemblies in accordance with NFPA 80 and NFPA 101 the Builders' Hardware team can help ensure your facility is prepared for various audits by knowing how -- and when -- you need to comply with NFPA 80 rules. Deliverable - Each fire rated door assembly will be evaluated using specific criteria, and documentation of the results of this inspection will be made available to you, and your facility. Facility managers throughout the region utilize the Builders' Hardware and Specialty Company inspection services to help ensure their facility's fire door assemblies are in compliance with the new mandates. The U.S. Centers for Medicare & Medicaid Services (CMS) adoption of the 2012 edition of NFPA 101: Life Safety Code® requires that health care facility operators conduct a yearly inspection of fire door assemblies in accordance with NFPA 80: Standard for Fire Doors and Other Opening Protectives. Their recent adoption of the 2012 edition of NFPA 101, the Life Safety Code, requires fire door assemblies to be inspected annually. CMS has notified its state agencies that it will begin surveying for compliance with the 2012 edition on Nov. 1, 2016. If you are responsible for NFPA 101, NFPA 80, and CMS compliance (for example: facility managers, building owners, consultants, and contractors) find the time to contact Builders' Hardware and Specialty Company to learn how we can help you with your facility inspections. As part of the service, Builders' Hardware also assist your staff in knowing exactly what surveyors will request during audits. 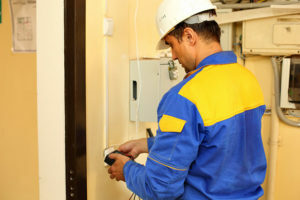 As industry professionals, our certified staff understands the door types encountered along the egress paths within your facility, the door locking means permitted, the thirteen verification points required for the yearly inspection of swinging fire door assemblies, and the skills required to serve as the Qualified Person who is permitted to perform the inspection and testing in accordance with NFPA 80. We can even help you judge the adequacy of door type for each common occupancy wall opening in accordance with NFPA 101.
Who is responsible for the maintenance and care of fire rated door assemblies? Building Owners - Responsibility rests solidly on the shoulders of the building owners. Building owners who fail to comply with the regulations can be prosecuted and fined or even sent to prison. The role of the inspector is to simply record and report the condition of the door assemblies to the owner. Owners will have to decide if, when, and what corrective actions will be taken; otherwise they will run the risk of being cited for violations by the Authority Having Jurisdiction (AHJ). AHJs confirm that inspections have occurred by reviewing the documentation and verifying that the necessary corrective actions were taken to repair assemblies that were found to have deficiencies. AHJs rely on the expertise of industry personnel to correctly perform and document the inspections of egress and fire door assemblies. NFPA 80 is the standard that regulates the installation and maintenance of assemblies and devices used to protect openings in walls, floors and ceilings against the spread of fire and smoke within, into, or out of buildings. NFPA 80 addresses general requirements and provisions for care and maintenance of fire doors and other opening protectives. Fire-rated doors are an integral part of your building’s overall fire protection system. The condition of fire doors and their components is included as part of the fire risk assessment. An organization, office or individual responsible for enforcing the requirements of a code or standard, or for approving equipment, materials, an installation, or a procedure. Who has the authority to enforce NFPA 80? Authority Having Jurisdiction (AHJ) - With continued authority, AHJs will confirm that the inspections occurred by reviewing the documentation and verifying that the necessary corrective actions were taken to repair assemblies that were found to have deficiencies. The AHJ community will rely on the expertise of industry personnel to perform and document the inspections.